The Thermosafe Lifting Frame is the easy to use mobile lifting system for applications where fixed mechanical handling is not appropriate. 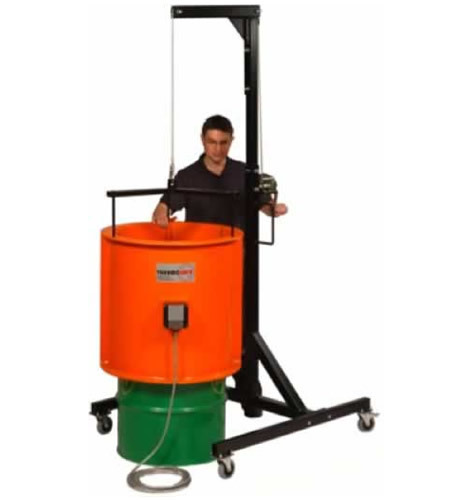 Designed specifically for use with a Thermosafe Induction Drum Heater, the Lifting Frame offers a simple solution to the day-today operational requirement that may occur in a busy production environment. Due to the unrivalled heating rates of the Thermosafe, frequent drum changes to heat more products with the same heater can often be required. A Thermosafe can be moved quickly and easily by just one operator to drums situated at their point of use. The speed and flexibility of the Thermosafe Induction Heater means that in busy production environments frequent drum changes are often required. The Thermosafe may be moved and lifted manually under appropriate supervision. With a weight of 48kg it can be lifted over a drum by 2 persons. Alternatively a number of handling options are available to reduce worker fatigue and comply with any site specific workplace practices. Designed only for use with a Thermosafe Induction Heater, the Lifting Frame offers a simple solution to maneuvering and lifting a Thermosafe. Each heater can then be positioned quickly and easily by just one operator. The sturdy steel frame is fitted with a braked winch easily capable of lifting the Thermosafe heaters. Robust and lockable casters are fitted to the frame, and simple retaining bars and clips are used to secure and quickly release the Thermosafe. The Lifting Frame is suitable for use in hazardous areas, certified to the requirements of the ATEX Directive 94/9/EC for non-electrical equipment and Machinery directive 98/37/EC. The Lifting Frame can be supplied in two base widths; a wider width to incorporate drums on pallets, or a standard unit for applications where this is not necessary. An optional fork lift attachment for the Thermosafe enables a heater to be lifted using your existing fork lift truck. The robust steel frame is connected to the heater using simple retaining bars and clips. An anti-slip covering is applied in the area in contact with the forks. The three pre-drilled top flange holes can also be fitted with eyebolts to accommodate your own lifting and fixing solutions on site.